Komen LA County is the local source for funding breast cancer detection, support and educational awareness in Los Angeles County. Through its community grants, Komen Los Angeles County is making key investments in the health of our community through education, cancer detection, resource navigation and support programs. We are currently funding 10 local organizations that serve uninsured or underinsured women in need. 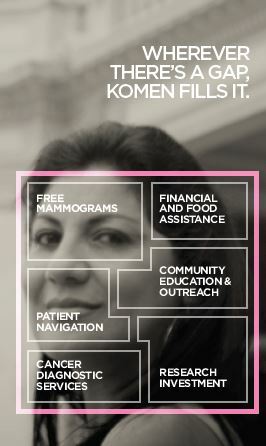 Since our founding in 1995, Komen Los Angeles County has invested more than $10 million in local breast health services. Each year and estimated 2,000 people lose their lives to breast cancer in LA County. Komen Los Angeles County’s community health grants are working to reduce this number while also improving the lives of those living with breast cancer. Funding for a total of 9 Community Grantees providing vital breast cancer health services for woman and men in Los Angeles County. $234,045.00 in funds for community grants providing diagnostic, navigation and psychosocial support services. In addition to community grants, we also fund research. To learn more about Susan G. Komen’s research investment, click here. The funding period for the 2018 – 2019 Community Grants Program is April 1, 2018 to March 31, 2019. Interested applicants are required to first respond to a Letter of Inquiry to be released in September/October 2017 to indicate interest in Komen LA County funding. Letters of Inquiry are by invitation only. To be sent an invitation, please contact the Komen office. Komen LA County does not fund individuals. After the LOIs are reviewed by leadership, selected applicants are invited to respond to a Request for Application (RFA). Selected applicants are then invited to submit a full Grant Application. These grant applications are reviewed by an independent review committee with those selected to receive funding notified via email. Any non-profit organization that provides breast health and/or breast cancer services that satisfy our funding priority areas may apply for a community grant. All inquiries regarding Komen LA County’s Community Grants should be directed to the Manager of Mission Programs at 310-575-3011 or via email info@komenlacounty.org.